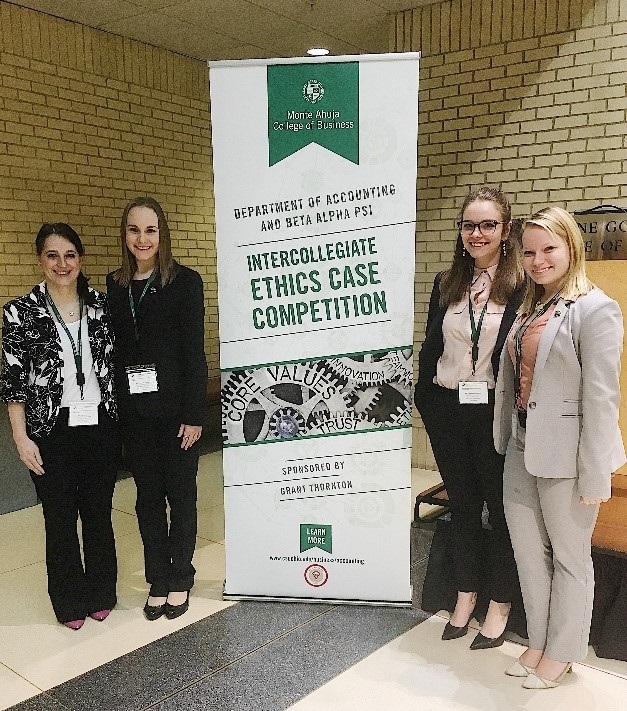 Three University of Akron Accounting students competed in Cleveland State’s 1st Annual Intercollegiate Ethics Case Competition on Saturday, April 14th. The students were given a case about the entanglement of KPMG, a global network of professional firms providing audit, tax and advisory services, in the South African Gupta-Zuma Corruption Scandal and asked to do further research. As part of their investigation, the teams were required to perform an analysis of the situation and provide recommendations. The UA team of Shelby Amatangelo, Cassandra Cameron and Makayla Pushak took second place in their pool. Just a couple weeks later, The George W. Daverio School of Accountancy made another splash at the 2018 Ohio Region Meeting of the American Accounting Association (AAA). Each year, the Ohio Region of the AAA hosts a Student Manuscript Competition at their regional meeting. Submissions are welcomed in two categories: Undergraduate and Graduate. Nate Rellinger, a Senior in the Accelerated B.S./M.S. in Accounting program, took 1st place in the Graduate category with his paper, Perceptions of Decision Aid Restrictiveness in Taxation. Several School of Accountancy faculty members were also in attendance and had the honor of presenting research and serving as moderators, speakers, and presenters throughout the weekend. Attending faculty included Professor Dr. Thomas G. Calderon, Assistant Professor Dr. Thaddeus A. Neururer, Associate Professor Dr. Li Wang, Associate Professor of Practice Ms. Julianne Jones, Assistant Professor Mr. Lei Gao, Assistant Professor Dr. Doron Narotzki, and Associate Professor Dr. Melanie McCoskey.